Hillary Clinton: "The world is watching for every opportunity to invest in Iraq"
WASHINGTON (CNN) -- President Obama said U.S.-Iraqi ties are entering a new period, a change marked by a decreased emphasis on security and an increased focus on the Iraqi economy. 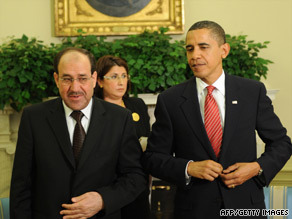 Iraqi Prime Minister Nuri al-Maliki, left, and President Obama pose for a picture in the Oval Office on Tuesday. Appearing before reporters Tuesday with Iraqi Prime Minister Nuri al-Maliki, Obama said the men discussed a wide-range of issues and didn't fixate on security or the military. Al-Maliki was in Washington to attend the two-day Iraq Investment and Business Conference and meet with American officials. "What is wonderful about this trip is that it represents a transition in our bilateral relationship, so that we are moving now to issues beyond security and we are beginning to talk about economy, trade, commerce," the president said. Obama cited Iraq's "continuing progress," strides on investment, and "a commitment to democratic politics." He also cited the election legislation delayed in Iraq's parliament because of disagreement on several issues. The scheduled January 16 parliamentary elections might not be held if legislation isn't passed soon. U.S. and Iraqi officials are concerned that a delay in the voting, or a resurgence of violence ahead of the election, could unravel the country's growing stability and its "increasingly attractive" environment. "We are very interested, both of us, in making sure that Iraq has an election law that is completed on time so that elections can take place on time in January," Obama said. "That is consistent with the transition that has been taking place," he said, stressing his commitment to troop withdrawal. His administration plans to withdraw U.S. combat troops by August and all troops by the end of 2011. Obama said the conference, where al-Maliki and Secretary of State Hillary Clinton spoke earlier on Tuesday, will be well attended by U.S. and Iraqi business leaders. "There are obviously enormous opportunities for our countries to do business together," Obama said. "I just want to congratulate Prime Minister Maliki on what I'm confident will be a successful conference, and to re-emphasize my administration's full support for all the steps that can be taken so that Iraq can not only be a secure place and a democratic country, but also a place where people can do business, people can find work, families can make a living, and children are well-educated." Al-Maliki called the conference "a big economic demonstration," saying the event "brings together more than 1,000 business entrepreneurs and a very distinguished, high-level Iraqi delegation." "I have also discussed with President Obama the various issues and the fact that our relations today have moved along and [are] not only confined to the security cooperation, but today have moved to the economic development and to providing prosperity for the Iraqi people," al-Maliki said. Among the issues they discussed were national elections and the importance of ending international sanctions against Iraq stemming from the Gulf War in 1991, he said. Al-Maliki noted that "we don't have weapons of mass destruction anymore, and today that we have put forth a lot of common sacrifices, and today that there is a pluralistic political system in Iraq." Saying Iraq wants to give U.S. business a chance to invest there, al-Maliki said the nation "has moved beyond the dictatorship and beyond the destruction, and we are trying to rebuild all our sectors -- of agriculture, oil sectors, tourism and so forth." Speaking at the conference -- billed as the "first major event under the recently signed Strategic Framework Agreement" between the United States and Iraq -- Clinton plugged Iraqi investment opportunities before U.S. businesspeople, saying the Mideast country's potential is "palpable." Clinton said Iraq's economic potential is "fueled by but not limited to oil production." "We believe strongly that economic development will go hand in hand with an increasing and very clear commitment to democracy," she said, noting that is a change from Iraq's former isolation from the global economy because of warfare and sanctions. "Our overall engagement will deepen and broaden," she said. "We are guided by the blueprint called the Strategic Framework Agreement, which identifies several areas in which the United States and Iraq will collaborate, including governance, rule of law, environmental protection, science, health, education, and especially economic development and the promotion of trade." At the same time, she underscored the importance of staging timely national elections and adopting a comprehensive hydrocarbons law in the oil-rich and ethnically diverse nation that sits at a key geographic crossroads. Those are two things that would go a long way toward making Iraq stable, she said. One stumbling block to the election law is the ethnic differences in Kirkuk, the northern city where Kurds, Arabs, and Turkmens have been at odds. Another dispute centers on whether to have open or closed electoral lists. Open lists would name candidates and their parties; closed lists would name only parties. Clinton said resolving political conflict, such as the Kirkuk dispute; promoting national unity; resolving political conflict; and pursuing return and resettlement of Iraqis displaced by war represent key steps that must be taken. While Iraq has many challenges ahead of it, she added, "we are excited to be part of this transition that is occurring in Iraq" -- illustrated in part by U.S. combat troops leaving major Iraqi cities and local security forces taking their place. "What we see is a new sense of commitment to the future," Clinton said. The secretary of state ticked off several other strides in Iraq, including electronic banking there and air travel to the holy Shiite city of Najaf. She cited the emergence of cell phone technology and pointed to a trip earlier this year by U.S. high-tech leaders that illustrated the potential of Iraq -- which long has had a well-educated society with a significant professional class. She said the State Department is launching a U.S.-Iraqi internship program in January that will place young Iraqis in technology start-ups, exposing them to an "entrepreneurial spirit" and helping them develop skills to use at home. "This represents a new approach to diplomacy that targets a group that will have a major impact on Iraq's future, namely the young people of Iraq," she said. As the government continues to make reforms and as security improves, Clinton said, the "world is watching for every opportunity to invest in Iraq" and "companies that wait too long may discover they are too late." At the conference, al-Maliki noted the country's new climate, saying the violence that raged a few years ago is over, thanks to the fight by security and U.S.-led forces against terrorists, criminals and former members of the Saddam Hussein regime, which was overthrown in 2003 after the U.S.-led invasion. During his first visit to the United States a few years ago, al-Maliki said, everyone talked about the violence in Iraq, a state of affairs he called a "very dark and painful" situation. Now, he said, Iraqis and visitors can freely move and work in the provinces they choose. He repeated what many Iraqis and Americans have said in the past -- that security and economic development go hand in hand. The conference will cover several sectors -- agriculture, banking/finance, defense, electricity, health, education, housing/construction, oil/gas, telecommunications, tourism and transportation. It will also "provide matchmaking opportunities for U.S. and Iraqi firms, address the challenges to doing business in Iraq, and provide opportunities for U.S. firms to meet with Iraq ministers and other senior Government of Iraq officials," the State Department said.